Two companies addressing two different aspects of the online video marketplace – live content interactivity and broader, high quality video distribution – both announced financing news Monday. For San Mateo based Conviva, it was a $20m Series B Financing. For Utah based Move Networks, it was news that Microsoft was joining prior Series C investors with an undisclosed strategic investment. A look at Conviva’s website gives a corporate summary high on style but relatively light on detail. Behind the scenes, the company founded by Carnegie Melon Professor Hui Zhang and Berkeley Professor Ion Stoica has had no problem privately convincing investors to open their checkbooks. Including the new Series B, Conviva has raised $29m since being founded in November 2006. The company’s team, estimated to be sized around 50 to 60 people, is focused on some combination of content delivery and content interaction software platform. The service appear to provide a mix of user-centered front end tools and distributor targeted back end behavior monitoring. 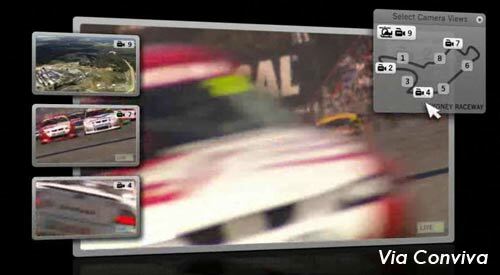 The demonstration video (a car racing example) shown on the corporate website (and here in the screen capture thumbnail) outlines a TV platform through which users will be create custom, personalized viewing experiences as they watch live content. Based on the examples shown a viewer might have the ability to choose footage from different live camera angles, overlay different viewing windows, or otherwise customize their experience. In some ways, the result appears like TiVo on steroids. They can: fast forward, rewind, change the viewing angles, see an overview, make a note..respond to a poll…share content with a friend…etc. It’s unclear if the platform, called “C3”, is peer to peer based or something more traditional in structure. In April, Conviva did hire former Akamai GM Carlos Ramon as their CEO. The new Series B was led by UV Partners. Series A investors NEA and Foundation Capital also participated. More information on the Conviva platform is expected to be released within the next month. 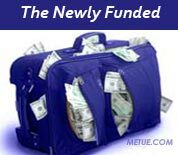 The PDF Financing release is here. Information on Conviva’s Founder’s academic background, and area’s of expertise, can be found here for Hui Zhang and here for Ion Stoica. Conviva was formerly called Rinera. Move Networks provides high quality video streaming services. In April, the Utah based company that counts ABC, Discovery Communications and Warner Brother’s among its clients, announced an enormous $46m Series C financing. The C Round was led by Benchmark Capital but also included contributions from Cisco, Comcast (via Comcast Interactive Media) and Disney’s venture arm: Steamboat Ventures. Today, it was reported Microsoft has joined the company’s list of strategic investors. Microsoft contributed an undisclosed sum as part of the same C Round. The investment builds on a partnership begun in early March. At that time, Microsoft announced their “Silverlight” cross-browser plugin would support Move’s streaming technology. Not including the Microsoft investment, Move Networks has raised more than $67m in three rounds. Move Network’s technology, together with Microsoft Silverlight, are expected to feature in the delivery of live video streams from this week’s Democratic National Convention.